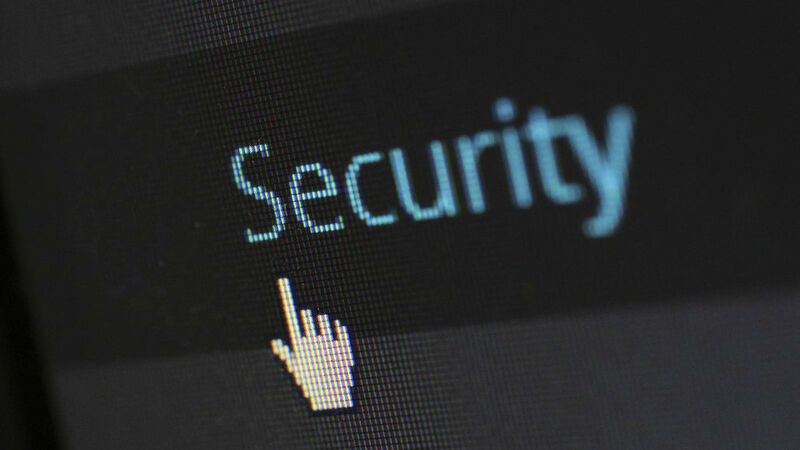 Whether your website is for fun or is your business, increasing the number visitors is something you must work hard at. Visitors are vital if you hope to make money from your site! But how do you get them? There are many ways to increase your site’s visitors and SEO (search engine optimisation) is just one of them. However, it is an important one and making sure your site provides Google, Yahoo!, Bing and other search engines with exactly what they need is crucial to your site’s success. The aim of SEO is to get your website and web pages high up in search results from the major search engines. The ultimate goal is to get your site onto page one of the search results because a lot of people don’t bother to look at the second, third or other pages of search results. Being the first link in Goole search results is like winning the lottery! You can make a lot of money from a site that is the number one result for your website topic. 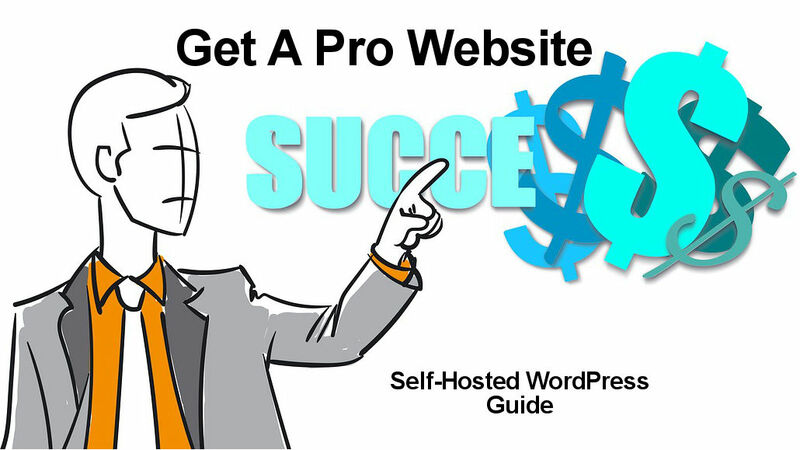 Remember that the ultimate aim is to make money from your website. This is achieved by getting lots of visitors. You do that by optimising your site for search engines. This article will not get you to the number one spot in the search results. Not all by itself. Rising to the top of the search results at Google, Bing and other search engines involves many different strategies and a lot of time and effort. This article is just the beginning and is the first step on the journey to getting more website visitors. Before you consider anything else, begin by installing an SEO plugin in WordPress and make sure your web pages and website is optimised for search engines. Only when your website is right can you explore other SEO techniques. 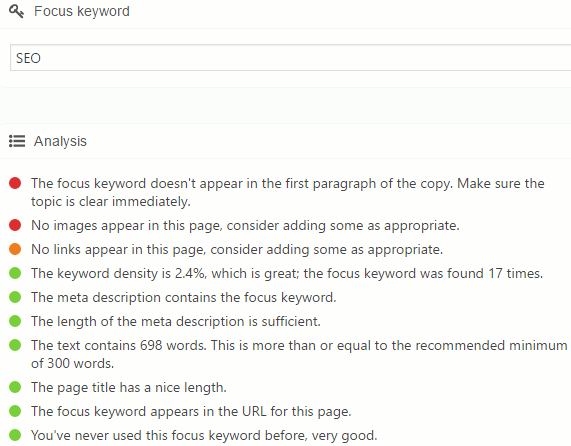 A search for SEO at the wordpress.org website produces over 1,000 results. 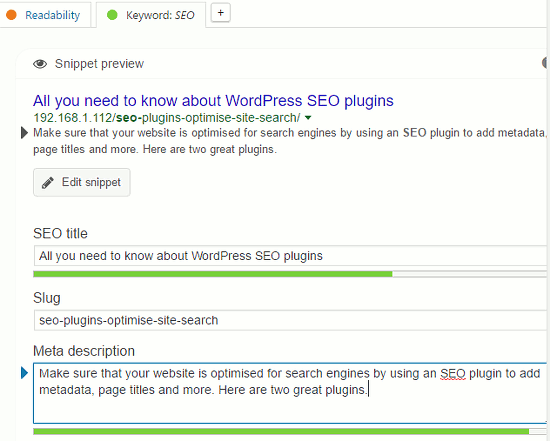 There are more plugins for WordPress that help with SEO than you can imagine. Which ones are best? How many installs are there? Which version of WordPress is it compatible with? The number of installs shows how popular a plugin is and if thousands of people use one, it is a sign that it is good. Look at the number of installs when browsing plugins at the WordPress website. It is important that a plugin is regularly updated are because it will have bug fixes, security fixes, compatibility fixes and sometimes new features too. Check when it was last updated. Avoid plugins that have not been updated in the last year. WordPress is under constant development and it changes with each new version. It is vital that any plugins you use are compatible with the latest version. Make sure it works. Two SEO plugins stand out from the crowd and most people install one or the other. Yoast SEO and All-in-One SEO are the best two search engine optimisation plugins for WordPress and are recommended. Both have over 1 million installs, are updated regularly, and are compatible with the latest version of WordPress. Let’s take a look at these two plugins. Yoast SEO is slightly more popular than All-in-One SEO and it is available in free and paid versions. You get a few more features if you pay, but the free version is fine for most people. Here’s how to install it into WordPress. Select Plugins on the left and then click Add New at the top. 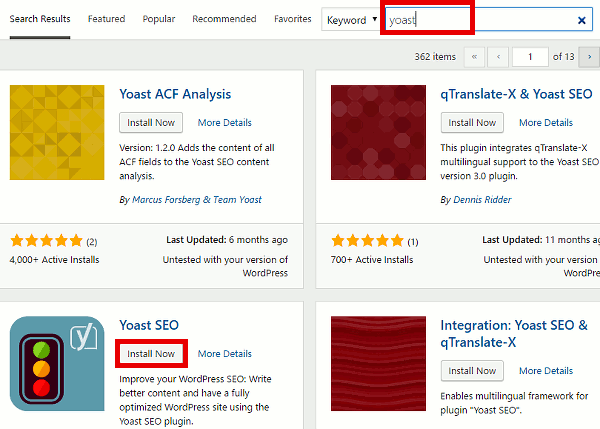 Type ‘yoast’ into the search box and then click the Install Now button next to Yoast SEO in the search results. Click the Activate button after installing it. 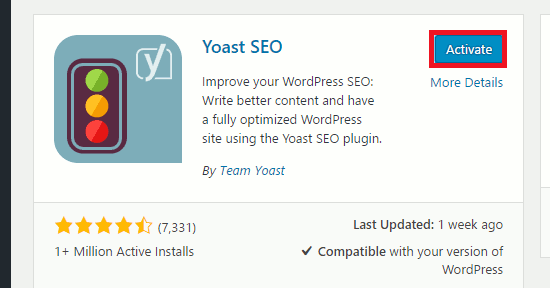 You can also do this by selecting Plugins in the sidebar and clicking Activate next to Yoast SEO. The plugin works straight away and starts optimising your site and posts for search engines. However, there are lots of configuration options and it will prompt you to work through them. 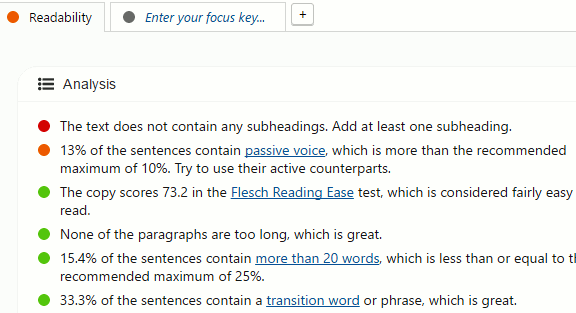 In fact, one of the features of Yoast is that it is always nagging you to do stuff, which is very useful for novices. Select SEO in the sidebar to access Yoast. Select the General tab and click Open the configuration wizard. Skip anything you don’t need or don’t understand. You can return later and add more stuff. To get started, fill in the Social Profiles page with your Facebook, Twitter, Pinterest and other social media URLs. Set the title of the blog and you are done. When you are writing a new post for your website, scroll down to the bottom of the page and there is a Yoast section. Select the Readability tab and it analyses the text and uses a traffic light system to highlight good and bad points. Avoid red blobs and try to get everything green. Select the Keyword: SEO tab and click Edit snippet. This enables you to enter an SEO title and meta description. The Snippet preview at the top shows how this page will appear in Google search results. Use it to write the perfect title and description in the limited space that is available. Further down is the Focus keyword. When people search at Google and other places, they enter keywords like ‘cookie recipe’ or whatever they are looking for. This is a keyword (sometimes two or three words) and it should be in your article. Yoast analyses everything and uses the traffic light colours to show what is right and wrong. This makes it a great tool for novices and it draws their attention to potential problems with the SEO. This plugin is available in free and paid versions. The free one is fine and you can install it and use it, then upgrade later if you need more features. It works without any configuration and you can install it and forget about it. However, it works a lot better if you customise the settings and take advantage of the many features it offers. When creating a new post, scroll down to the bottom of the page where it provides facilities to enter the page title, meta description and meta keywords. These are essential for improving the SEO and making web pages useful to search engines. Fill in these boxes every time you post an article. 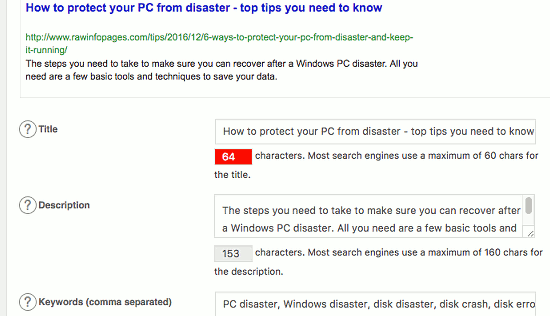 The plugin shows a preview of what the post will look like in Google search results. This enables you to ensure that it is perfect for search – it must have a great title and description that is neither too long nor too short. 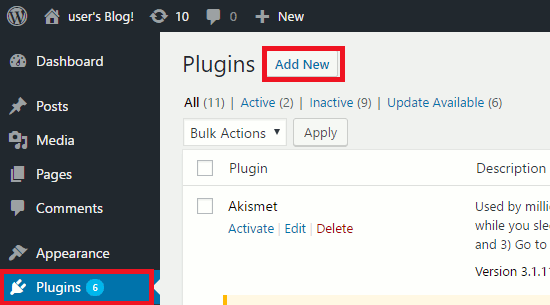 Go to the All-in-One plugin settings in the WordPress sidebar and you can add a page title and meta information like a description and keywords for the website home page. Sometimes web services and plugins require code to be inserted into the header of web pages, like SumoMe, Google Analytics, and so on. All-in-One SEO provides an easy way to do this. Which SEO plugin is best? This is a tough question to answer, but Yoast SEO is best for people that are new to blogging and website building. It tells you if your writing is poor, if you forgot to put a keyword in the title, if the paragraphs are too long and so on. It does more hand-holding and guidance. All-in-One SEO is best for more experienced bloggers and website owners. It gives you the tools to optimise your site, but it does not try to tell you stuff you already know. For example, how to write titles, how to write descriptions, how to keep paragraphs short and sentences simple. It has some extra features that mean you don’t need other plugins, such as inserting code into headers and support for Google Analytics. This website uses All-in-One SEO in case you are wondering.